China is Taking Over America Right Now! The USA created Communist China. The news media tells us whatever the New World Order tells them. All information that is shared with the public is based on the New World Order agenda. It is all controlled, rigged reality with a purpose and by design. In China, the state is their god and in that "god" they trust. For generations, the people have been brainwashed to believe in and trust government. Chinese officers disembark from helicopters aboard US Navy aircraft carrier USS Wasp underway in the South China Sea. General Chiang Kai-Shek visits US Navy aircraft carrier USS Wasp (CV-18) underway in the South China Sea. A US Navy helicopter lands on the flight deck of the aircraft carrier. Lieutenant General Liu Kuo Yen and Major Huang Hsiung Shen disembark from it. They are greeted by United States high-ranking officers. The Chinese officers inspect United States Marines Corps honor guard. The US Navy helicopter lands on the flight deck. Admiral Soong of Chinese Nationalist Navy disembarks from the helicopter. Commander Pei Yuffen also disembarks from it. Location: South China Sea. Date: January 9, 1954. If China and the satanic USA govt can't defeat us through their deceptions, then the USA government will bring the Chinese military to attack us. Are you ready for this? We are living in the endtimes of the Bible. When the military aged Chinese people start showing up in Detroit and other strategic locations in America, keep this video in mind. These women will kill Americans just as easily as the American military is killing innocent people around the world. Brainwashing works. These Chinese troops, disguised as "regular" folks, are the equivalent of a Trojan Horse. They are being pre-positioned to overthrow the American communities where they are stationed, just like American troops are pre-positioned in 1000 military bases in 139 countries to overthrow the countries around the world. Notice in the link below, the shoulder patch that has the word SWAT. SWAT is an English word. 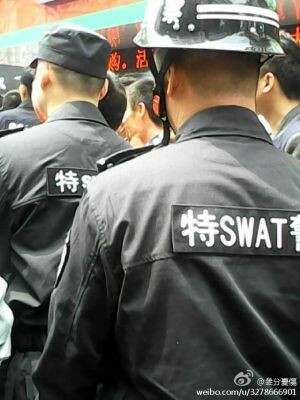 Why would a Chinese police officer need an English word on his uniform unless he is going to be operating in an English speaking location, like America? Notice the American police tactics being used in the video below. The first few seconds shows a van marked POLICE. 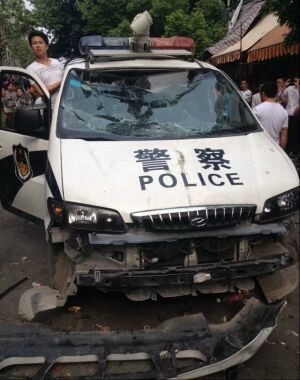 Why is China marking their police vehicles with English words unless they intend to use them in English speaking areas? Notice in the video below, at the 1:13 mark, a few more countries are named where the USA military is training foreign troops for the One World Military. "Mao Zedong, founder of the People's Republic of China, qualifies as the greatest mass murderer in world history"
"At least 45 million people were worked, starved or beaten to death in China over these four years; the worldwide death toll of the Second World War was 55 million." "America is training police officers from around the world to form a One World Police Force that is led by the USA. The goal is to have every police officer in every country on the same page. 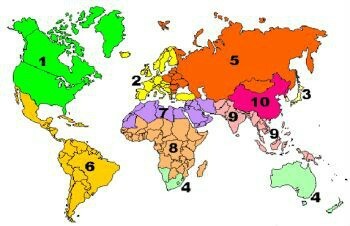 You can't have a One World Govt if every country does things differently." 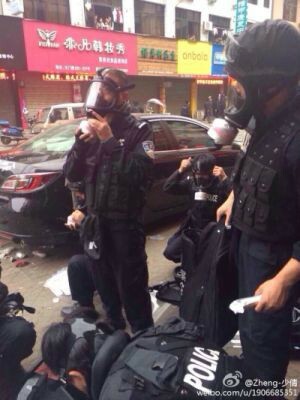 Remember that the USA is training police officers from other countries in the same way. The police and the military are becoming standardized worldwide. "But there were clear signs that the military-to-military relationship between the two great powers is maturing and deepening. Gen. Fang said he and Dempsey ”agreed on many issues” and ticked them off. They will explore creating “mutual notification of major military activities” and how to craft “standards of behavior” for air and sea forces. They will also strengthen “strategic dialogue between the two strategic planning departments” and “continue advancing” army to army to dialogue." "Perhaps most interesting in the long term was mention by the Chinese chief of staff about holding joint exercises with the United States in “a third country.” No details were presented, but taken with China’s participation this year in RimPac, the world’s largest naval exercise, this would mark an important commitment by both militaries to building a regular working relationship." China tests logistic ability of moving it's troops: If they do not have plans to move their troops, why would they need to test the logistics? "China on Tuesday kicked off a major military exercise to test battle readiness of the world's largest standing army "under real war circumstances" that would also test the logistic ability of moving its troops." Simultaneously, warships of Russia, Japan, Vietnam, Australis and the Philippines are engaged in the first stage of Komodo 2014 multilateral exercises in the South China Sea. "The Komodo 2014 multilateral naval exercise in the East Sea involving 18 countries, including Vietnam, kicked off its first episode on Monday under the theme “ASEAN Cooperation Navy for Stability,” local newswire Vietnamplus cited Russian media as reporting." Out of 17,508 islands, they named the joint training after the dragon. This was NO co-incidence. Do you have your firearm and ammo yet? The USA govt is bringing the Chinese military here to kill, conquer, and destroy America. In 1967 when the first five members of ASEAN declared their aspiration for regional cultural and economic cooperation, the world and Southeast Asia in particular, was a very different place. Today, in geo-political terms, regional security is more complex than it was fifty years ago. Given the significant economic and political developments in the intervening decades along with a doubling in ASEAN membership to ten regional nations, the ASEAN ‘Declaration’ was seen by some to be increasingly obsolescent. However, in 2008 a revitalised Association produced the new ASEAN Charter which characterised a mature ASEAN, one that reflected a more worldly-wise and realistic outlook. "Beginning in the fall of 2011, the Obama administration has issued a series of announcements and taken a series of steps to expand and intensify the already significant role of the United States in the Asia-Pacific region. Explicitly identifying the Asia-Pacific region as a geostrategic priority for the United States, the Obama administration is paying a higher level of attention to the region across a wide range of issue areas. This represents a significant shift in U.S. policy. However, the story of the rebalance is not a story of U.S.disengagement and then re-engagement in Asia. Instead, it is a matter of emphasis and priority, building on an elaborate foundation of U.S.-Asia relations that was already in place. The United States has had powerful national interests in the Asia-Pacific region since World War II and was deeply engaged in the region – militarily, economically, and diplomatically – throughout the Cold War. The post-Cold War administrations of presidents Bill Clinton and George W. Bush were actively engaged in Asia." Colonial Elites Rule China For "The Illuminati"
Vatican influence on domestic and foreign policy of the U.S. is not unique. All governments except China are victims of this Vatican manipulation of government policy. In 1971, Time magazine reported their interception of a confidential document issued by Pope Paul. Satan is the old serpent and he has twisted what Scripture says to deceive those Marines into serving and honoring him. The USA is corrupting the world and China is a major part of it. And yet the USA govt has allowed China to make parts for the USA military F-35 fighter. Good........ GOOD ...... GOOD China. "CHENGDU, China (AP) — The U.S. and Chinese militaries on Friday wrapped up a modest disaster-relief exercise hailed as a tentative trust-building step amid growing suspicions between the Asia-Pacific region's largest armed forces. The USA is using joint military training exercises with other nations of the world to get everyone on the same page as the One World Military is being created by the USA govt eight before our eyes. USA govt is trying to work around the Japanese Constitution to build up Japan's military. In order to enhance and improve effectiveness, interoperability, readiness, mobility, and sustainability of the operations of the U.S. forces and the Self-Defense Forces,and to strengthen deterrence of the U.S.-Japan Alliance, the Ministers welcomed progress in peace time bilateral defense cooperation, such as the expansion of timely and effective bilateral training. Bilateral and multilateral exercises, both hosted by Japan and in areas outside of Japan, have improved interoperability and sharpened our ability to deter aggression, defend Japan, and maintain regional peace and security. " The word "interoperability" means having everyone on the same page when the One World Military, that is lead by the USA govt, forms in front of the whole world. All a person needs to do is realize that these things are happening around the world to real people who have never done anything to the American People. This is going to happen in America soon. The video below shows military troops training with video games. That's right.... video games just like your children are playing with right now and that children have been playing with for decades. Do you think children "playing" with computer games was just for fun? Not even close. It's all part of the bigger plan of recruiting "trained" children into the military where they will apply their acquired skills (from "playing" computer games) in the real world of combat. Video games are Satan's training tool. Programming users to shoot to kill with no conscience or thought for human suffering. The most important part of this video, is the interview with the sergeant at the end. At the 3:50 mark, he tells us exactly why joint training is so important. You are hearing it from an active duty soldier, who probably does not understand the BIGGER picture of what is really happening in the world. China and USA representatives, better known as "the enemies" are visiting each other's military facilities, because that is what "enemies" do, isn't it? We all know that the best way to defend America is to show the "enemies" of America, our defenses, right? Chinese companies are on a shopping spree in the U.S. investment doubled in 2013, reaching a record high of 14 billion dollars. And in the latest purchase is a taxpayer-backed electric car company was sold to a Chinese manufacturer. Marina Portnaya reports. One of Satan's most common schemes: he presents the bait and hides the hook. The bait was the dinner and promised $300 for attendees. After they attended they learned the conditions attacked to the $300. Satan hides the hooks and presents only the bait. Temptation offers shortcuts to fulfillment; it promises quick contentment. Obedience to God is the only sure route to satisfaction. On the macro level, this event was conditioning (bait) and ingratiation of Chinese leaders with America under the guise of "charity." Ingratiation is a psychological technique (spiritual warfare) in which an individual attempts to become more attractive or likeable to their target (American citizens). This term was coined by social psychologist Edward E. Jones. Understand that Satan's deception extends beyond disguising his person to also disguising his activities under various cloaks of "doing good deeds" with hooks attached to the bait. Satan downplays the seriousness of sin so that it appears to pose no danger to the human soul. In the videos on this page, you have seen multiple joint training exercises between the USA and Chinese militaries despite the constant mantra that China is our enemy. You have seen the USA govt allowing China to invest in the USA stock market. You have seen the USA govt allow China to buy a US electric car company and then allow that company to start building said electric car in Detroit. "Chinese have paid $4.5 billion dollars to build a solar plant on the Bundy property. The Clark County (NV) Commissioners are on the hook for that money. This is why one of their minions threatened to send anyone traveling to the aid of Bundy home in a body bag. There is absolutely no way that the Bundy Affair is over." Sites are reporting that Harry Reid is in cahoots with ENN a Chinese firm for which his son works to take over the range area in dispute with that Nevada rancher and the Bureau of Land Management. The Bundy Ranch in NV standoff with BLM is being attributed to Harry Reid's desire to help his son secure rights for a Chinese company to build a solar energy farm in the Nevada desert. "ENN Group Co Ltd, one of China's largest private companies, is quietly rolling out plans to establish a network of natural gas fueling stations for trucks along U.S. highways. With plans to build 50 stations this year alone, ENN joins a small but formidable group of players -- including Clean Energy Fuels Corp and Royal Dutch Shell Plc -- in an aggressive push to develop an infrastructure for heavy-duty trucks fueled by cheap and abundant natural gas. Clean Energy is backed by T. Boone Pickens and Chesapeake Energy Corp."
China to join U.S.-led naval drill for first time- June.10th.,2014 - BONTV China. Listen to the beginning of the report about China joining the USA in a joint training exercise. We hear "tensions rise between the 2 countries". How do we know that tensions are rising? What is the proof, other than the govt and the TV news telling us? Do you remember Sandy Hook and when the LIAR named Paul Vance of the Connecticut State Police kept telling us about all of the dead children? He lied to us. The "news" lied to us. Sandy Hook was a HOAX. And the hoaxes keep on happening. It's like watching professional wrestling as those actors put on their show. Evidence is ALL that matters. Chinese leaders and USA govt leaders are FRIENDS, no matter what they SAY. They are Hollywood ACTORS who are following their scripts. "Foreign buyers of US residential real estate surged 35 percent last year, with Chinese buyers, searching for moderately priced, safe investments in a sea of economic and political uncertainty, outspending the rest of the world. Chinese buyers spent $22 billion on US homes in the 12-month period ending in March, or about 24 percent of total foreign sales by dollar value, according to a study released Tuesday by the National Association of Realtors (NAR). That’s up from $12.8 billion, or 19 percent, on the previous year." China OWNS the US and Canadian meat industry. HONG KONG and SMITHFIELD, Va., September 26, 2013 - Shuanghui International Holdings Limited ("Shuanghui International") and Smithfield Foods, Inc. ("Smithfield") announced today that they have completed their previously announced strategic combination. "The recent acquisition of Smithfield Foods, Inc., by Chinese food producer Shuanghui International has left many Americans feeling concerned about the future of food safety. Chinese companies have brought tainted dry wall, pet food and other food products into the United States in recent years. This deal has caused many Americans to question food safety policies especially in companies with foreign ownership." Shuanghui bought Maple Leaf Foods (Canada) when they purchased Smithfield Foods as Smithfield Foods owned Maple Leaf Foods.